Named for the original (1835) grantee José Antonio Caro. 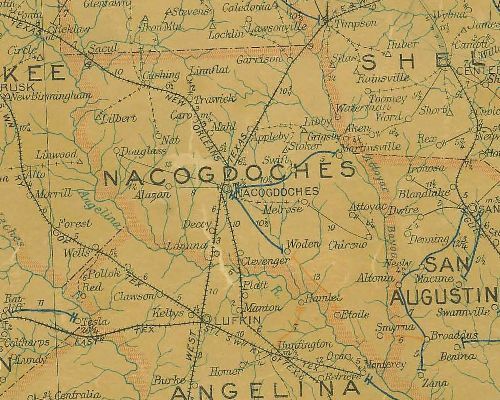 There was some settlement prior to the Civil War, but like much of East Texas, things didn’t get underway until the railroad or the lumber industry appeared. Around the turn of the century, the exploitation of the forests was in full swing. Caro was one of the centers of logging operations and there was money to be made sending logs off to be converted to lumber. So much money that a small railroad could be subsidized. 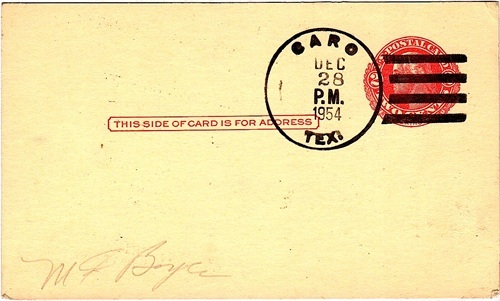 The Caro Northern Railway (around 1906) started carrying logs to Mount Enterprise (Rusk County). Caro was thriving just prior to WWI. The population was reported to be around 1,300 people. Caro had its own sawmill in operation and businesses included a grocery, two drugstores and a general store. But after the war came a slump. The sawmill closed even before the Great Depression arrived, sending the economy to lower depths. By the mid-1930s the population had fallen to a mere 150 residents where it remained for decades. Having lost all of its businesses over the years, Caro became a ghost town, it’s building either falling into decay or being salvaged for other uses. It was designated a “dispersed rural community” – which could be loosely translated as a ghost town with no infrastructure. The dispersed residents were counted as 113 for both the 1990 census and the 2000 census.